Also See: How to reply Twitter messages from Slack, How to block websites in Chrome Android browser. 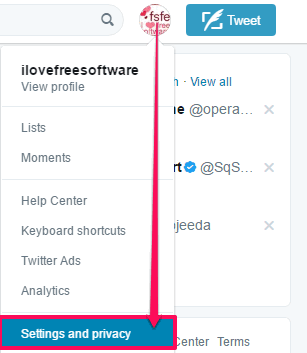 Step 1: Open Twitter and then click on your profile picture at the top-right and select the “Settings and privacy” option, as shown in the screenshot below. Step 2: Now, you will see the Twitter settings page, switch to the Notifications section to manage notifications settings. You need to enable the “You don’t follow” option from the “Mute notifications from people:” to stop getting notifications from people whom you don’t follow on Twitter. In addition to this, you can also choose to stop receiving notifications from people who have a default profile photo, who haven’t confirmed their email, and who haven’t confirmed their phone number. That’s all you have to do to mute notifications from Twitter users whom you don’t follow. In this tutorial, I explained a simple method to mute notifications from people whom you don’t follow. The best part is that you don’t have to use any third party apps or method to do so and this simple notification setting can be turned on right from Twitter “Settings and privacy”.